by Maggie Bonanomi This is a little tale about three sisters living in rural Lafayette County in the mid 1800s. 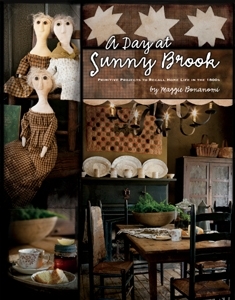 Inspired by the rich colors of a vintage quilt, an 1899 book of advice, and a favorite doll, Maggie Bonanomi brings you the world of Sunny Brook School for Girls. Explore and make the necessary items for every part of their lives: classroom study, sewing, exercise, rest, finer skills and sleep. Maggie supplies the projects that will take the girls though their days! And what an abundance of projects: a sampler, mending baskets, a chatelaine, pincushions, a fireplace screen, pillows and more pillows, a throw, pinched purse, several hooked rugs, a bed cover, daily books, even a flower press. The golden hues of Sunny Brook School await you.